A granulomas is a cluster of macrophages. The generally accepted definition of what constitutes a cluster of macrophages is a minimum of five cells. Lymphocytes may be admixed with the granuloma or distributed around it. Granulomas form when the inflammatory / immune system is confronted with an infectious organism or other material that resists standard phagocytosis by neutrophils and lone macrophages. In order to overcome this challenge, the macrophages adopt a co-ordinated approach that attempts to enclose the target by creating a prison around it in the form of a granuloma. 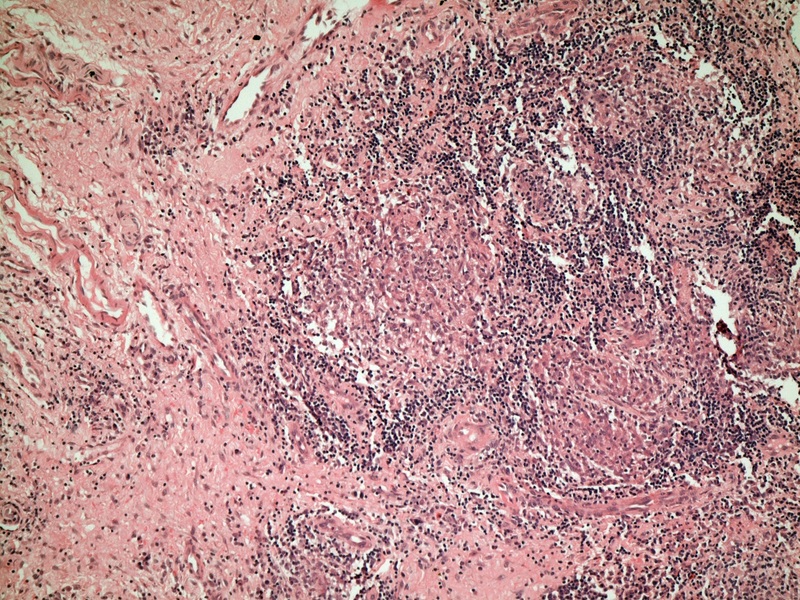 Granulomas often feature giant cells. Giant cells are created when several macrophages fuse to form a single cell. The nuclei of the individual cells can still be discerned as independent structures within the giant cell. Giant cells are a complementary tactical manoeuvre to granulomas. While the granuloma is a ploy to contain the resistant organism or substance, giant cells represent a final attempt to phagocytose it and destroy it; if one lone macrophage cannot engulf the enemy on its own, then possibly by fusing with other macrophages to form a single gestalt entity the united macrophages can produce a super cell that has enough phagocytic capacity to accomplish the task. Granulomas are a feature of many different diseases. In the infectious diseases within this list, the micro-organism is the stimulus for the formation of the granulomas. The trigger is often unknown in the non-infectious diseases (sarcoidosis, Wegener's granulomatosis and Crohn's disease). Mycobacteria are an unusual type of bacterium that are resistant to killing by phagocytosis by neutrophils and macrophages. Although the bacteria can be engulfed, they prevent the fusion of the lysosome, which contains the various substances the phagocytic cells employ for killing, with the phagosome in which the ingested bacteria are located. Mycobacteria are also capable of stopping the phagosome from being acidified. Thus, although they may be confined within the macrophage, they are able to survive and multiply. In order to deal with these recalcitrant mycobacteria, the macrophages switch to their granulomatous strategy. Important species of mycobacteria include mycobacterium tuberculosis, which causes tuberculosis, mycobacterium leprae, which is the cause of leprosy and mycobacterium avium intracellulare, which produces opportunistic infections in some immunocompromised people. Granulomas are classified into caseating and non-caseating granulomas. Caseation is a macroscopic description of a form of necrosis that resembles cheese. It is highly suggestive of tuberculosis but can also occur in other granulomatous diseases like histoplasmosis (a form of fungal infection). 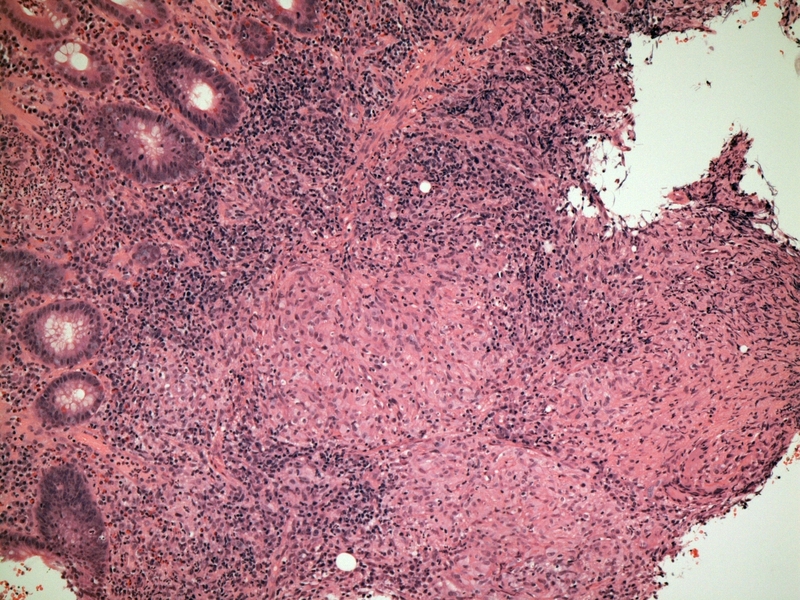 To complicate matters, some other granulomatous diseases may typically (such as Wegener's granulomatosis) or occasionally (for example sarcoidosis) show granulomas that are necrotic but do not yield the macroscopic appearance of caseation. In practical terms, there is some merit in considering granulomas as necrotic or non-necrotic, being aware of the phenomenon of caseation and assuming that a disease which features necrotic granulomas is tuberculosis until proven otherwise. The emphasis on tuberculosis is important because it is a potentially curable disease but if it is overlooked, the misdiagnosis that is offered in its place will usually lead to the patient being treated with steroids. The immunosuppressive effect of steroids in a patient who has tuberculosis can be catastrophic. This granuloma shows early necrosis that is visible in the form of small blue dots that represent degenerate nuclei located within eosinophilic material. In this case, the diagnosis was tuberculosis, but the appearances in this image are not diagnostic and could be found in other granulomatous diseases. Beyond the simple division of granulomas into caseating and non-caseating (or even the alternative necrotic and non-necrotic), there are claims that the granulomas of different diseases will have different appearances. The granulomas of sarcoidosis tend to lack many admixed or surrounding lymphocytes and are described as 'naked' granulomas. The granulomas of Crohn's disease are often somewhat half-hearted and may be referred to as loose. Although attempts to recognise nuances in the precise morphology of granulomas may have some use, it cannot be relied upon to base a specific diagnosis. Numerous lymphocytes surround this collection of several granulomas and also permeate the granulomas themselves. The formation of a granuloma requires a co-ordinated immune response. Organisation of much of the immune system is the role of the T lymphocytes. Thus, if T cell function is impaired the immune system may be unable to form granulomas. In the case of infections that are normally opposed by a granulomatous response, this failure can allow the infection to run riot. Clinically, this means that some tests which would normally be strongly positive in a good going granulomatous infection will be negative because they rely upon a granulomatous response for their positivity (the main example is the Heaf test in tuberculosis). The mechanisms that allow granulomas to form frequently also induce activity in fibroblasts and therefore cause fibrosis; this fibrosis can assist in the containment of the organism. 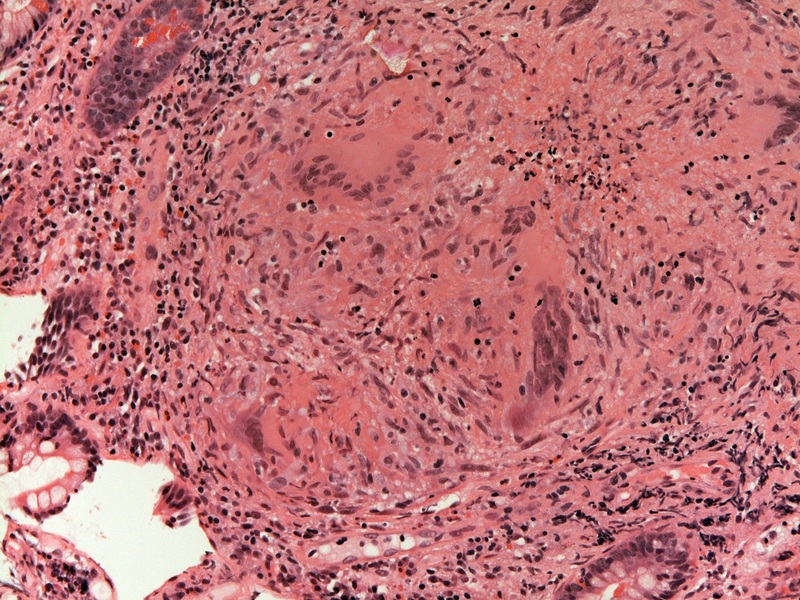 However, the space-occupying effect of granulomas within the micro-anatomy of an organ when coupled with this fibrosis is responsible for many of the clinical features of granulomatous diseases simply because having granulomas and fibrosis where there should be normal tissue impairs organ function. If the granulomas are necrotic, the tissue destruction that accompanies this necrosis exacerbates the situation. The signs and symptoms that result from this basic form of pathology will vary from organ to organ but share this common cause of replacement by granulomas and fibrosis and will generally be centred around organ hypofunction and sometimes a mass effect if the granulomatous and fibrotic response is very marked. 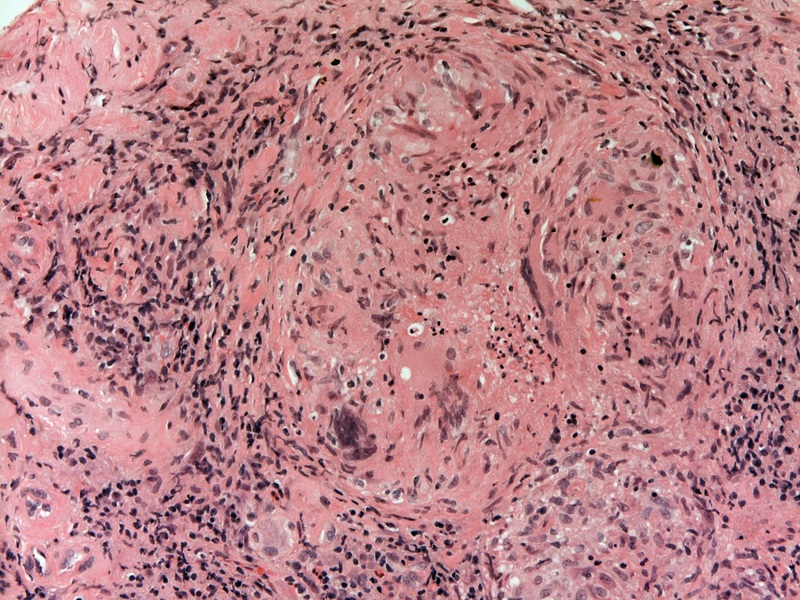 If a histopathological specimen, particularly a biopsy, features granulomas, it is often not possible to offer a definitive diagnosis as to the origin of the granulomas based upon the histopathology alone. To an extent, this reflects the ability of tuberculosis to affect virtually any organ in the body and the fact that the absence of necrosis in the granulomas does not exclude tuberculosis; there may also be other infections that need to be considered. Instead, the histopathological findings have to be placed in the overall clinical context that will typically include the results of microbiological analysis of the affected organ(s). Histopathology specimens can be stained for mycobacteria, but the organisms are often elusive and a negative stain does not exclude infection, so microbiology is essential. Furthermore, only microbiological analysis can determine to which antibiotics the mycobacteria are sensitive.